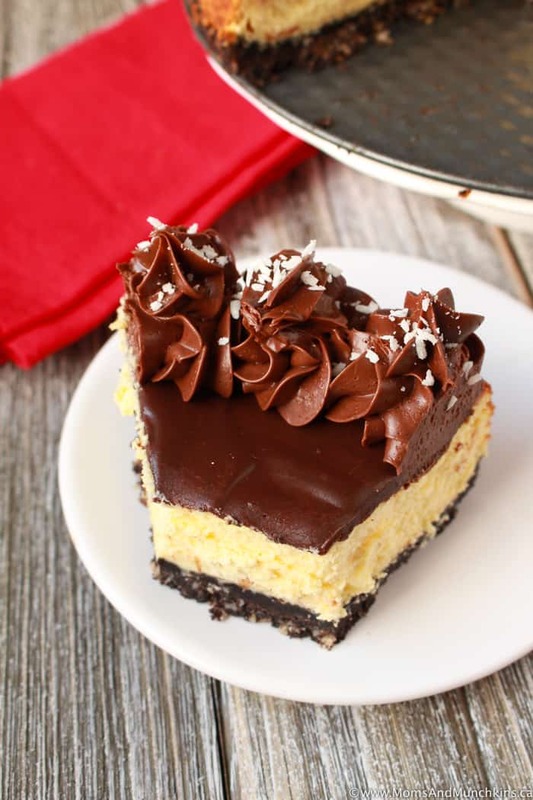 If you’re outside of Canada, you may not know what a nanaimo bar is. Let me tell you – you’re missing out! 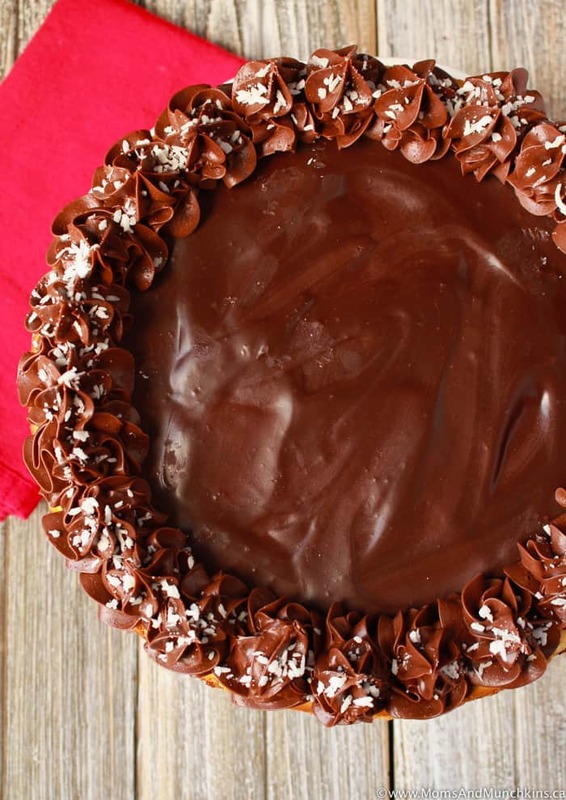 It’s a delicious mixture of chocolate, coconut and custard and it’s a party favorite here in Canada. What could possibly make a nanaimo bar even more delicious? Turning it into cheesecake! 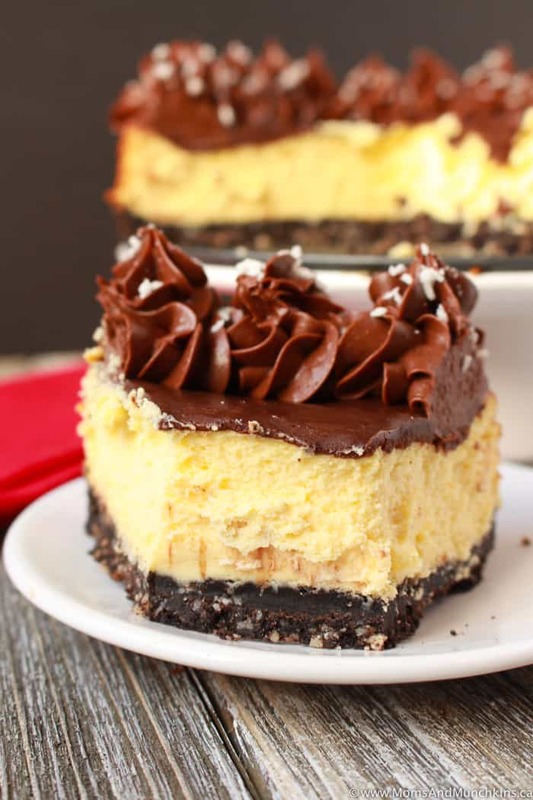 Yep, all the deliciousness of a nanaimo bar turned into a Nanaimo Bar Cheesecake! Grab your drool bibs and let’s hop into the recipe. 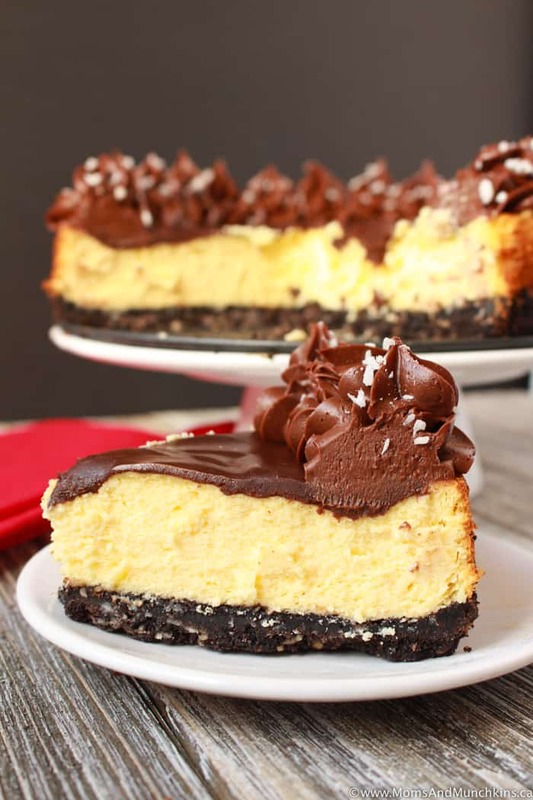 Nanaimo bars are a favorite around the holiday party season but this cheesecake can be enjoyed all year long. Really, is it ever the wrong time for dessert? Nope! 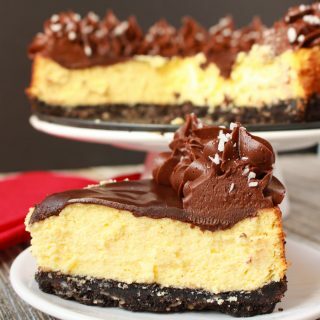 Note that this cheesecake is best when refrigerated and chilled overnight before serving so make sure you work that timing into your party plans. This Nanaimo Cheesecake recipe takes a classic Canadian dessert and upgrades it to a delicious cheesecake! Stir together the cookie crumbs, melted butter and coconut until the mixture is well combined. Press this mixture into the bottom of a parchment paper lined 9" spring form baking pan (parchment lining between the crust and the bottom of the pan isn't required but it sure makes for easier removal of the cheesecake). Put this in the refrigerator while you combine the cheesecake filling. Beat in sour cream, custard powder, vanilla and flour until smooth. Pour cheesecake batter over chilled crust and smooth top. Bake until the middle is set (no longer jiggling). This takes about 80-90 minutes. Let cool completely on wire rack (about 1 hour). Prepare ganache topping: Place chocolate in a medium bowl and set aside. In a small saucepan, heat cream over medium heat (stirring constantly) until it starts to boil slightly. Remove from heat and immediately pour over chocolate. Let sit for 5 minutes then stir until completely mixed. Let this cool in the fridge for 30 minutes before pouring on top of cheesecake. Cover cheesecake and refrigerate for at least 4 hours before removing from the pan. Best if left to chill in refrigerator overnight before serving. Top with chocolate icing swirls and extra toasted coconut. To toast the coconut, I heat it in a small frying pan over medium heat (stirring constantly as it burns quickly) until it reaches the desired level of crispiness. You'll want to let the toasted coconut cool before sprinkling over the cheesecake. 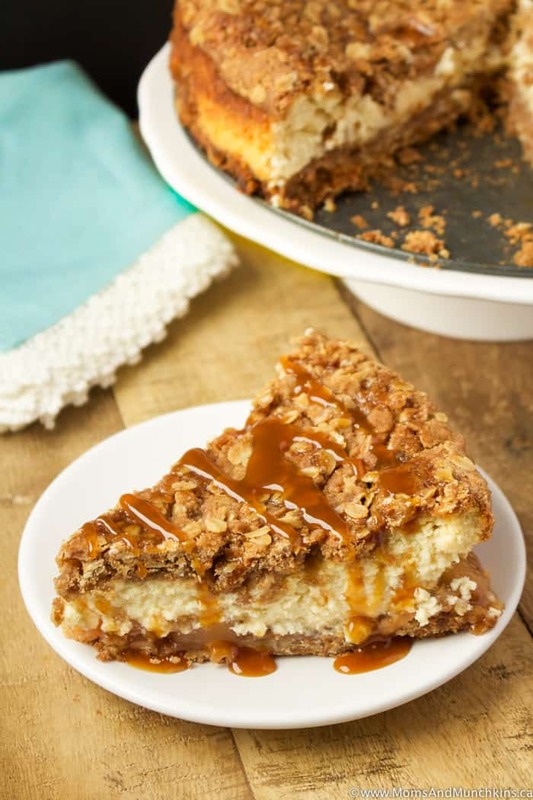 Apple Crisp Cheesecake – the ultimate fall dessert! 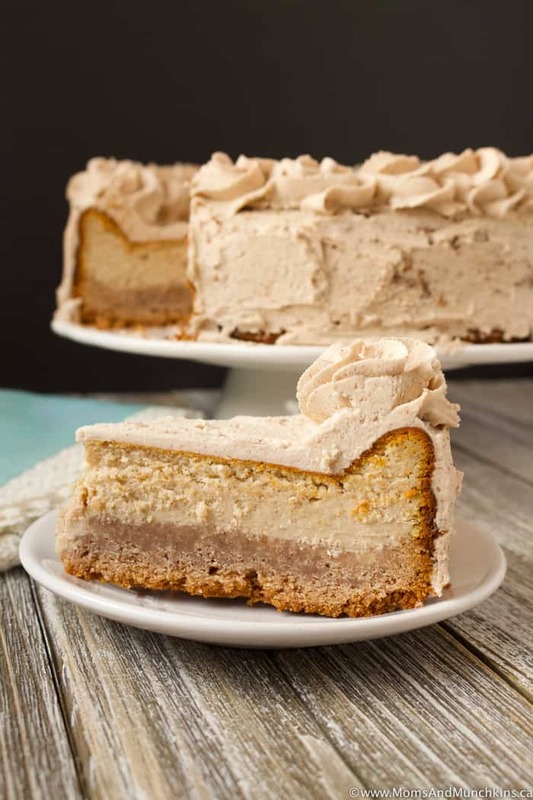 Cinnamon Bun Cheesecake – why settle for one dessert when you can have 2-in-1? Visit our Recipes page for more information. Stay updated on the latest home entertaining ideas and recipes by following Facebook, Twitter, Instagram and Pinterest.